Rebecca Holderness is a director choreographer professor and producer whose work is noted for its passion, with and physical beauty. Recent projects under production include THE RIVER by Jez Butterworth at Spooky Action, Washington DC. 2017. In 2018 the NSF - I corps program and the Newauke Co-Lab 2019 Holderness began researching methods to shift the narrative of the city core. 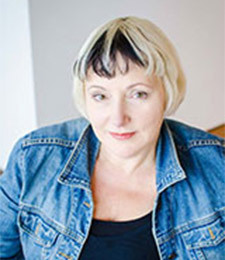 In 2013 Holderness was named a Zelda Fichandler Award finalist for her invigoration and expansion of theater in the Midwest. In 2014-2015 she directed the premier THE LAST OF THE WHYOS by Barbara Weichman in Washington DC, THE CLOSELINE MUSE by Neena Freelon for national tour She most recently directed KING LEAR at Shakespeare and Company, THE WEDDING DRESS, KAFKA ON THE SHORE At Spooky Action DC, and RUINED at Burning Coal, MORE THAN 16 KISSES at the Drama League NYC. Current play and book under development BELL AND BLISS, a play about innovation and the consequence of resistance to change in 19C America. Holderness has also directed at Lincoln Center Theater and Institute, The Public Theater and Joes Pub, The Culture Project 45Bleeker, TheaterTweed/Ohio Theater, Julliard, and her own company in NYC, Burning Coal Theater, NC, Spooky Action, DC, and The Choregies D’Orange in France among others. Holderness has directed over 15 plays for UWM in small and larger spaces including 2 new musical plays generated in Milwaukee and 4 regional premiers of new plays. Holderness is an Associate Professor at UWM; member of SDC, Drama League, Lincoln Center and Chicago Lab Director and Associate Teacher of Fitzmaurice Voice She recently completed her training in Authentic Leadership Naropa University and completed her IYT 200 hour yoga teacher training in. MFA Directing Columbia University.